A program designed to help you create a budget, save money, make sound financial decisions, and build your wealth. First Step to Financial Success? Schedule a Meeting! There will be three shuttles that will pick-up every 10 minutes from the bus shelters throughout campus on the shuttle route. The shuttles will run from 9:00 a.m. - 6:30 p.m. EST. All shuttles will drop-off and pick-up around the campus, including the Floyd Street Garage. 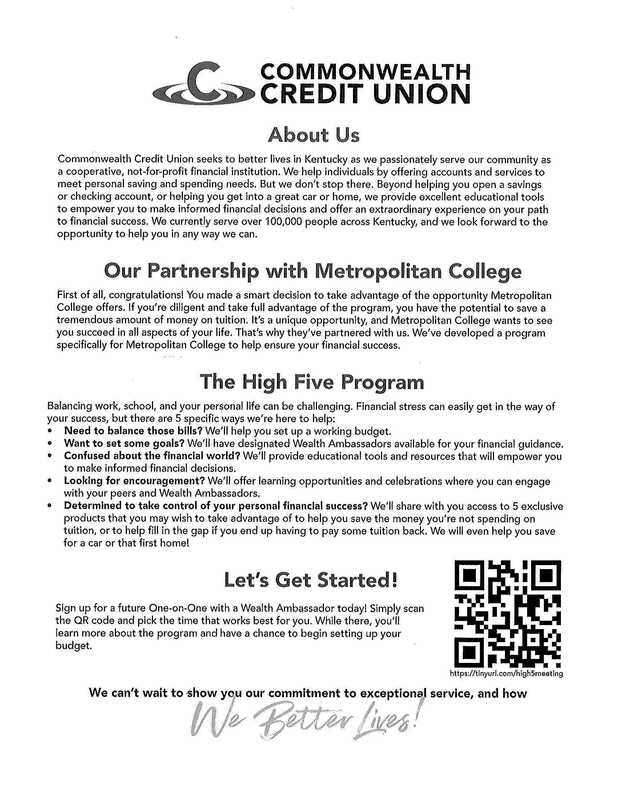 The High Five Program is designed for YOU, a Metro College student, to help build wealth and lay the foundation for a future of financial security and success. Each fall and spring semester, you will meet for 1 hour with a Financial Coach. A Financial Coach will provide you with guidance to build a budget based on your UPS paycheck, help you grow the wealth of your MC benefits (i.e. bonuses, books, etc. ), prepare you for financial emergencies, and help you develop savings for long term goals (i.e. car, house, etc.). Participants will complete 30 minutes or less of on-line financial education each semester. Your Commonwealth Credit Union Financial Coach is a resource for your financial health and success. Through your journey at Metro College, a Coach will help you navigate the path to understanding and assisting with your goals and help you achieve a healthy and sustainable relationship with your finances. They are a tool that will help you develop yourself and your future during this educational program. They will be available to you in large group settings and for one-on-one appointments to discuss topics such as budgeting, saving, financial services and products, short-term goals, long-term goals, and much more. Drew has been bettering lives with Commonwealth Credit Union since 2017. He serves our campus community at our University of Louisville Branch as a Financial Service Representative. Veniece has been bettering lives with Commonwealth Credit Union since 2013. She came to Louisville in 2016 from Frankfort to serve our membership at the University of Louisville Campus Branch as a Financial Service Representative. Bethany has been bettering lives with Commonwealth Credit Union since 2014 when the St. Matthews Branch opened. She serves as the Assistant Branch Manager.